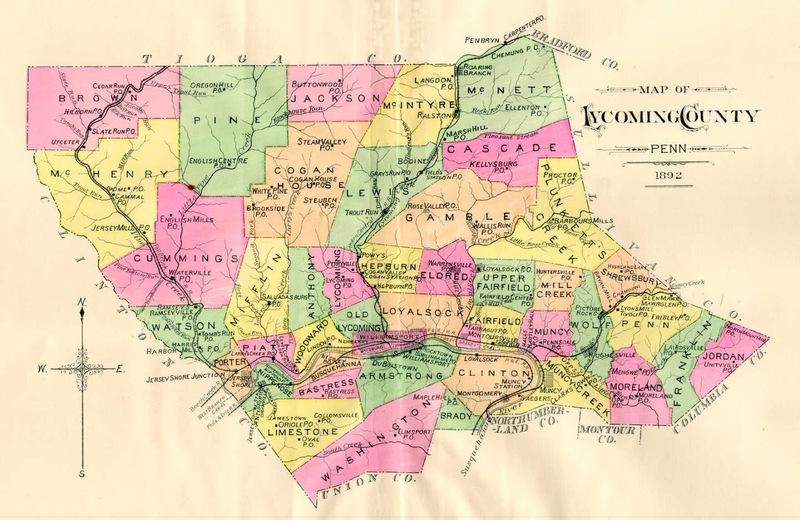 This week our journey by county through the archaeology of Pennsylvania takes us to Lycoming County. Located in the northern tier, close to the center of the state this county is located on the West Branch of the Susquehanna River. Secondary streams include Pine Creek and Little Pine Creek which flow into the Susquehanna from the north and Lycoming Creek which enters the Susquehanna near Williamsport. This county is located within the Allegheny High Plateaus section of the Appalachian Plateaus province with its southern territory in the Ridge and Valley province. The rugged terrain of the Appalachian Plateau attributes to the high percentage of sites (78%) located in riverine settings. These river terraces are subject to seasonal floods which distribute rich alluvial soils, ideal for agricultural activities. Bedrock underlying this area primarily consists of shale, sandstone and siltstone, none which possessed desirable minerals for lithic tool manufacture. However, local chert outcrops as well as chert cobbles which were glacially deposited here were widely used for tool manufacturing. Evidence of prehistoric occupation dates to the Paleoindian period (10,000-16,500 years ago) as indicated by fluted points recorded by William Turnbaugh in his survey of the West Branch Valley for the Pennsylvania Historical and Museum Commission in 1972. Pollen and faunal analysis for this period suggested a trend from Artic-like to temperate conditions. Faunal analysis indicates a series of narrow zones of micro-environments quickly changing from boreal forests to more temperate fauna types. 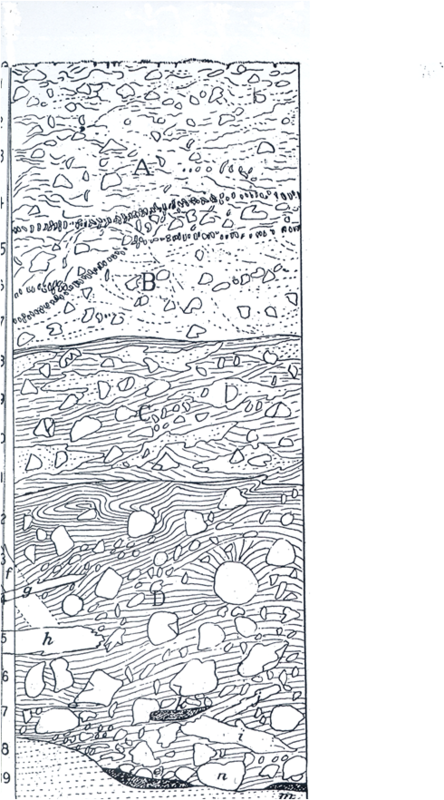 Turnbaugh noted fluted points of Onondaga chert from western New York, jasper, quartz and quartzite from the south and Normanskill flint from the east. The variety of lithic materials recorded by Turnbaugh increased our understanding of Paleoindian activities in the region and supported patterns of small groups or bands of transient hunters moving through the area seasonally. Turnbaugh conducted this survey during and after the devastating flood created by hurricane Agnes in June of that year. Due to the destruction created by the flood waters, more of the river bottom lands were exposed than would have been from normal cultivation allowing Turnbaugh to recover artifacts and record numerous sites. 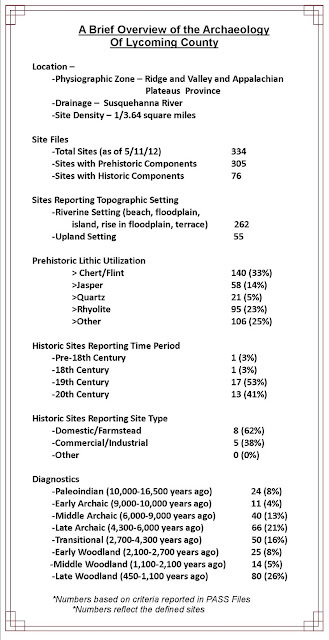 Turnbaugh acknowledged the assistance he received on this survey both from the North-Central Chapter 8 of the Society for Pennsylvania Archaeology and by several individuals including Mr. James P. Bressler. James Bressler and Harry D. Rainey reported on excavations conducted by Chapter 8 of the Society for Pennsylvania Archaeology situated at the confluence of Loyalsock Creek and the Susquehanna River near Montoursville from April 1997 to June 2000. The Snyder Site (36Ly287) was a floodplain site where topsoil mining activities potentially threatened to destroy the site. Richard Snyder, a member of Chapter 8 offered his property for excavation to the chapter, preserving evidence of a Late Woodland, Clemsons Island site. Pottery recovered during this excavation was identified as primarily Levanna Cord-on-cord(38%), Clemsons Island Punctate, and Carpenter Brook Cord-on-cord. A Total of 29,074 ceramic sherds were analyzed by the chapter. The collection is being curated at the Thomas Taber Museum, Lycoming County Historical Society. As mentioned earlier, the rich alluvial soils deposited on the floodplain provided fantastic conditions for an emerging agricultural society. Deep storage pits uncovered at Snyder site suggest food storage and trash disposal, indicators of permanent occupation. Analysis also revealed fish bones and scales of gar as well as small minnow-sized fish. Interestingly, no fish remains were recovered from Powys site and no squash remains were found at Snyder site. These are clear examples of why archaeologists must examine multiple sites to further our understanding of the lifeways of native peoples. A large semi-subterranean hearth feature was exposed during the excavations that required assistance from our own Jim Herbstritt to assist the chapter in excavating and interpreting their findings. Shenk’s Ferry pottery was recovered in deeper soils of this feature which led Jim to conclude that remnants of a keyhole structure were present beneath the upper level hearth. The presence of Shenks’s Ferry culture period ceramics (750-500 years ago) above Clemsons Island ceramics (1,000-650 years ago) indicated this overlapping activity. The term “keyhole” is applied from the pattern that these features leave in the soil. Their purpose is still debatable with theories ranging from sweat lodges to storage structures and smokehouses. Disturbance of a second keyhole prevented additional analysis as to their function at Snyder site. The dense forest cover encountered by Euro-american visitors led to the designation as the “Dismal Wilderness” (Wallace 1945). White pine, oak, chestnut and hickory created a thick, dark canopy. Historic records indicate settlement in the region began in the 1700’s with towns erupting along the same transportation routes that Native peoples used during prehistoric periods. The Tioga Path was an important foot path that later developed into Route 15 from Trout Run to Painted Post, New York, still a major transportation route through north-central Pennsylvania. Canals and railroads that ran through Williamsport contributed to its boom during the lumbering era. Construction of the Susquehanna Boom, essentially a man made dam, in 1851 helped to control the flow of logs streaming into the Susquehanna each spring. The demand for lumber after the Civil War attributed to making Williamsport the Lumber Capital of the World. Between 1868 and 1906 these mills sawed more than eight billion feet of white pine. Lumbering demand led to the construction of railroads and the Boom became obsolete. The flood of 1894 broke the Boom and washed approximately two million board feet of lumber down the river. By 1908 the great woods of northern Pennsylvania were depleted and the timber barons moved to the mid-west. Today, many of the homes on “Millionaires Row” have been restored and preserved for the future and serve as a reminder of the perils associated with depleting unsustainable resources. We hope you have enjoyed our visit to Lycoming County and it has inspired you to learn about the archaeology of your community. Understanding and exploring our archaeological heritage is pivotal to our understanding of human behavior and our ability to change and adapt over time- just as the peoples of Lycoming County have done for thousands of years. We close this week on one final disturbing note. Last week we shared information about the excavation effort by the Frances Dorrance Chapter, Society for Pennsylvania Archaeology at two sites near Duryea. Unfortunately, someone destroyed equipment and vandalized one of these sites this week . This chapter was working to preserve the archaeological heritage of their community, please educate those around you to the valuable role that archaeology plays in our communities and the importance in preserving and not destroying our heritage. This week our archaeological journey takes us to Luzerne County located in the Ridge and Valley Province and Appalachian Plateau of northeastern Pennsylvania. It contains two principal waterways, the Susquehanna and Lehigh, and these include numerous smaller watersheds that drain the county’s mountain and valley terrain. Bordered by eight other counties, Luzerne is situated within three physiographic sections of the Commonwealth where its geology is comprised essentially of Pennsylvanian, Mississippian and Devonian formations that are 290-405 million years old. For the most part, the rocks from these formations consist of sandstone, shale and beds of anthracite coal. Hence, the principal economic base of the county was coal based, wherein many deep shaft mines went into production during the 19th and lasted through much of the 20th century. Unfortunately, along with the economic boon that coal mining brought to the region many miner’s lives were lost from mine fires, “cave-ins” and other related misfortunes. The Knox Mine Disaster of 1959 essentially put an end to the coal mining industry in northeastern Pennsylvania. Earlier in the 18th century Luzerne County was the home of numerous Shawnee, Nanticoke and Delaware Indian towns. Some of these towns have since been eradicated by urban sprawl and the mining of topsoil in the main Wyoming Valley from Nanticoke to West Pittston. Assarughney, a former Delaware village was one of the larger Indian towns in Luzerne County, and it was located near the mouth of the Lackawanna River (Donehoo 1928). Other Indian towns were established at Wapwallopen, Naticoke , Plymouth, Wilkes Barre and at other locations along the Susquehanna River. Connecting these towns were overland trails and pathways that followed overland from one place to another. Smaller trails and pathways connected the Wyoming Valley to places on the Delaware such as the 18th Century Moravian settlements at Bethlehem, Pennsylvania. The Great Warrior Path that linked the Athens area in Bradford County to the Forks of the Susquehanna at Sunbury, Northumberland County (Wallace 1965) was another heavily traveled Indian path and played an important role in the American Revolution. Late in the 18th century, Luzerne county was the scene of the Battle of Wyoming where British, Tories and Indians massacred nearly 300 settlers at present Wyoming, Pennsylvania. Leading up the massacre was the indiscriminate “squatting” of land along the Susquehanna by Connecticut and Pennsylvania settlers. A monument marking the grave site can be seen in the town of Wyoming to honor the victims of this tragic act. 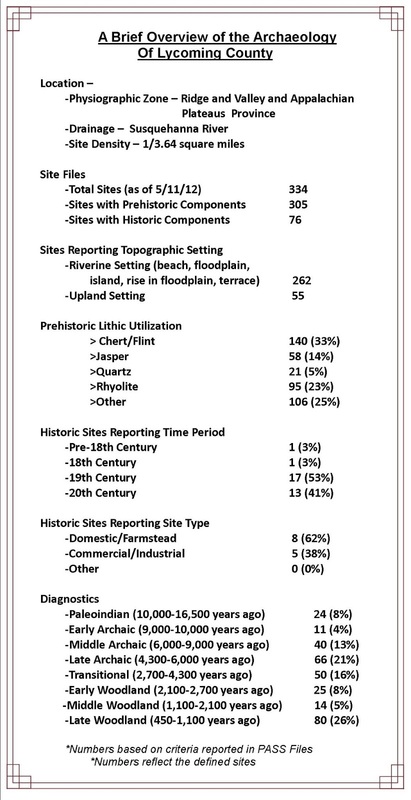 A review of the Pennsylvania Archaeological Site Survey (P.A.S.S) files for Luzerne County reports a site density of one site for every 2.89 square miles. There are nearly as many historic period sites as there are prehistoric period sites and taken collectively, span the range from the Paleoindian period through the 20th century. As well, there are nearly as many riverine related site settings as there are upland related site settings and these nearly equally represent all cultural periods. Not surprising, given their proximity to the Susquehanna River, many of the prehistoric sites have chert and rhyolite as the principal lithic materials. All of the rhyolite and much of the chert is found in bedded geological contexts from locations as far away as Adams County and as close as the forks of the Susquehanna at Sunbury, Pennsylvania. Late Archaic period lithic tools appear to be consistently made from local pebble cherts that were available in the river gravels all along the Susquehanna river and certain if its tributaries. Such tools made from jasper likely made their way into the county prehistorically from the Easton area where it is a principal lithic material used throughout prehistory. 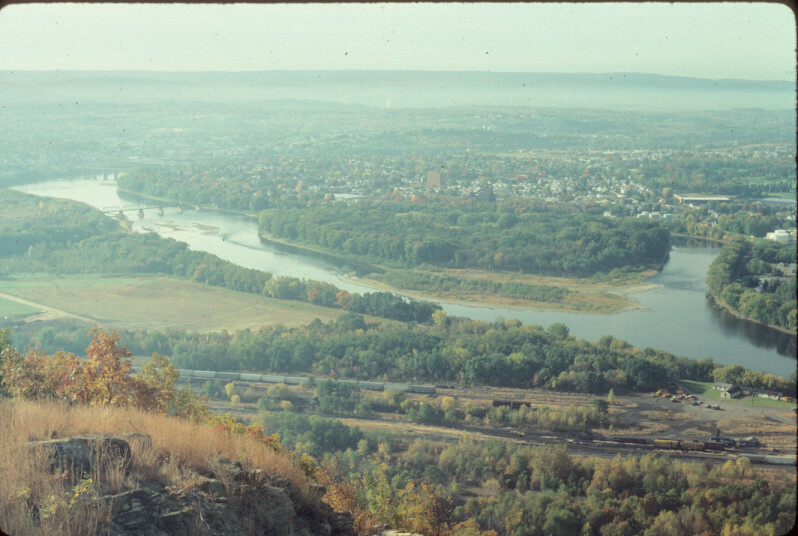 The general prehistory of the Wyoming Valley is characterized by archaeological camp and village site occupations representing all of the cultural periods that occur throughout the Susquehanna valley. 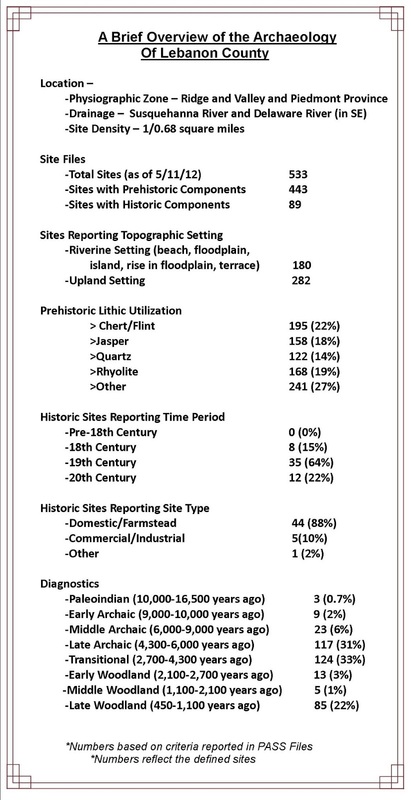 According to the PASS files for Luzerne County Late Woodland period sites are followed by Late Archaic period sites in terms of site density. Transitional period broad spear and Early Woodland fishtail sites follow next in site density with Middle Archaic, Middle Woodland, Early Archaic and Paleoindian sites diminishing in that order of frequency. 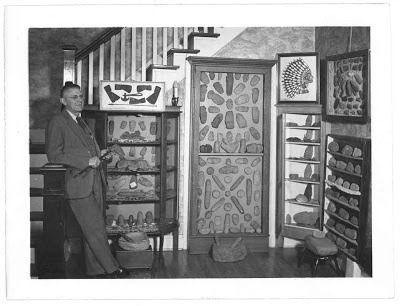 A large number of prehistoric tools in the Steuben Jenkins collection from the Wyoming Valley was acquired by the State Museum in 1923. Comprised of projectile points, preforms, ground stone objects that include celts, axes, pestles and pottery, the collection is representative of the kinds of artifacts found on archaeological sites in this section of the Upper Susquehanna. For sure, some archaeological sites in the Wyoming valley have been destroyed by major flood events, such as caused by Hurricane Agnes and as a direct consequence that information is lost forever. For the most part, earthen levees built along the river’s edge by the U.S. Army Corps of Engineers now protect much of the valley from flooding during most periods of high water. River bank surveys, before and subsequent to many of these flood events, and predictive site modeling, have been proven to be useful tools for soils scientists, geomorphologists, and ultimately archaeologists in identifying and evaluating archaeological resources within major watersheds such as the Susquehanna. One of these Wyoming Valley projects was completed in 1989-1990 by R. Christopher Goodwin & Associates, Inc. (Goodwin and Shaffer 1991). The Wyoming Valley Flood Protection Project covered 10 segments along the main trunk of the Susquehanna and at several other locations along two of its tributaries, Lackawanna River and Mill Creek. The primary purpose of the project was to delineate existing site boundaries, obtain information to assess their cultural importance and to provide new information on previously unreported archaeological resources prior to raising the height of the levee and floodwall and undertaking new construction of levees at Exeter and West Pittston and other nearby locations. This archaeological study generated important information on six prehistoric and historic period sites that were inhabited during the Late Archaic, Transitional, Early and Late Woodland and Historic periods. We hope you have enjoyed this journey to another part of Pennsylvania’s ARCHAEOLOGY! Please visit us next time when we will be featuring Lycoming County in the heart of the West Branch. 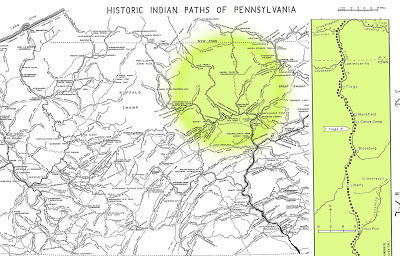 1928 A History of the Indian Villages and Place Names in Pennsylvania. Pennsylvania Historical Commission. Harrisburg. 1991 Phase II Archaeological Investigations within the Wyoming Valley Local Flood Protection Study Area, Susquehanna River Valley, Luzerne County, Pennsylvania. Report submitted to the U.S. Army Corps of Engineers Baltimore District. 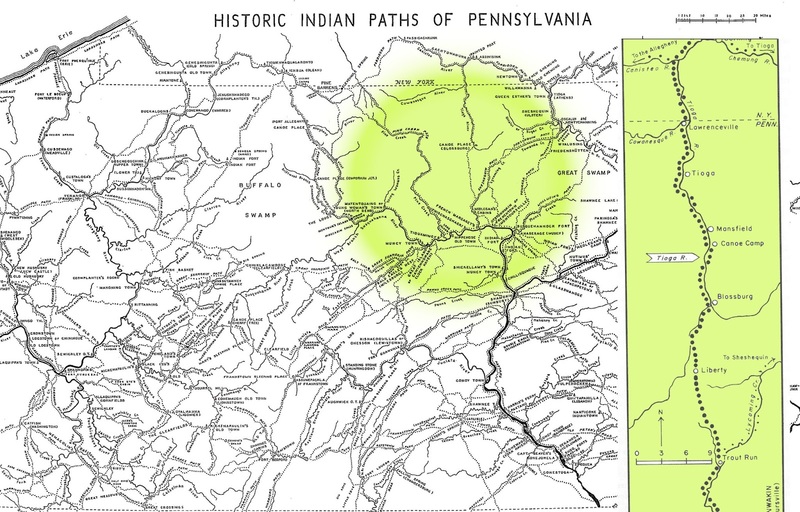 1965 Indian Paths of Pennsylvania. The Pennsylvania Historical and Museum Commission. This week our journey by county through the archaeology of Pennsylvania takes us to eastern Pennsylvania and Lehigh County. This county is mainly situated in the Great Valley section of the Ridge and Valley province with a small section of the New England province in the southern part of the county. The Lehigh River is the main drainage that eventually empties into the Delaware River. The major streams are the Little Lehigh and Jordan creeks. The Great Valley zone is largely a rolling terrain with small streams. This is reflected in site locations with only 40% of the sites in riverine settings. The main lithic resource is jasper with 34% of the sites producing artifacts of that material. Chert is the second most common toolstone with 30% of the sites producing that material. Both jasper and chert are found in local bedrock formations. The county has a moderate density of archaeological sites but only a few have been tested and these generally were surface collections rather than deep excavations. The largest excavations and most extensive research has been conducted at the jasper quarries and their associated workshop areas. Jasper is a micro-cryptocrystalline rock with a high silica content. It is a type of chert that contains small amounts of iron that gives it a brown or yellow color. Jasper turns red when exposed to heat but is usually not found that way naturally. Less commonly found examples are black or green. 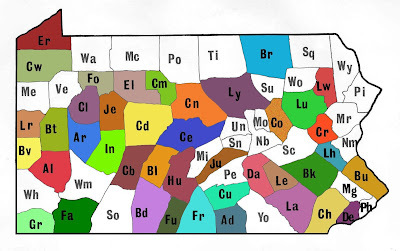 The jaspers of eastern Pennsylvania are located in the Reading Prong section of the New England Province and they are associated with the Hardyston formation which mainly consists of sandstone and quartzites. They are found at the contact between the Hardyston quartzite and the adjacent schist formation. In the Reading Prong, jasper is actually a sedimentary rock formed by a process called replacement. Over millions of years, silica from the Hardyston formation precipitated into voids in the schist forming large pockets of jasper. Jasper is an easily flaked toolstone with a very durable edge. It was extensively used by the prehistoric peoples of the region, as early as the Paleoindian period, over 11,000 years ago. Twenty-five percent of all fluted points in Pennsylvania are made of this mateial. The Transitional period (4,300-2,700 years ago) probably experienced the most intensive use of this material, especially in the production of Lehigh and Perkiomen broadspears, scrapers, drills and other tools. During this time it was also traded throughout the Middle Atlantic region, from Virginia to Vermont. In 1891 and 1892, Henry Mercer (1894) conducted the initial investigations of the Hardyston formation and documented ten jasper quarries in Lehigh (6), Berks (3) and Bucks counties (1). He focused his work on the largest quarries located near the communities of Vera Cruz and Macungie in Lehigh County. Here, he found these sites littered with layers of jasper flakes and the landscape pock-marked with 60 to over 100 prehistoric mining pits over areas of six to ten acres. Roland Hill reported in 1938 that the 140 pits at Vera Cruz, were from ten to thirty-five feet deep and ten to one hundred feet across. Mercer and some of his informants tested several of these to depths in excess of 30 feet and concluded that the prehistoric miners first removed jasper in near-surface context and then, as needed, began to dig deeper, gradually enlarging the excavations outward and downward. One of his informants reported putting shafts to 40 feet in a crater with a 100-foot diameter. At several sites, they found stone diggings tools buried in the pits. Mercer’s maps and publications introduced these sites into the archaeological literature and represented the foremost work on the quarries for nearly a century. Quarry profile - notice the sloping layers of jasper flakes. In the 1980’s, Professor James W. Hatch of the Pennsylvania State University conducted extensive surveys of the region in advance of the I-78 highway project. He documented numerous quarries and quarry related workshop areas. Anthony and Roberts (1988) followed up on this work and developed the Hardyston Jasper Prehistoric Archaeological District. Anthony and Roberts (1988) tested numerous workshop sites but none of the actual quarries. The district includes both quarry and non-quarry related sites and is identified by sites with predominantly jasper artifacts. Spanning a great deal of time, it includes sites from Paleoindian through Late Woodland times tracing the changing use of jasper mining and tool technology. The Hardyston Jasper Prehistoric Archaeological District serves as a historic preservation management tool for this important resource. James Hatch continued his research on the quarries and related workshop sites in the 1980’s and 90’s. Hatch was concerned with documenting how the quarries were used, the distribution of the mined jasper, and developing sourcing signatures. Chemically, he mapped six of these quarries in detail: Vera Cruz, Mast Farm, King’s, Urffer’ Farm, Lyons and Longswamp (the latter two are in Berks county). He could not map Macungie, Leinbach’s Mills, Frankenfield or Durham due to 20th century development. He conducted limited controlled surface collections at Vera Cruz, Lyons and Kings quarries and, at Vera Cruz, he hand-excavated quarry pits and mapped deep backhoe profiles through some of the pits. 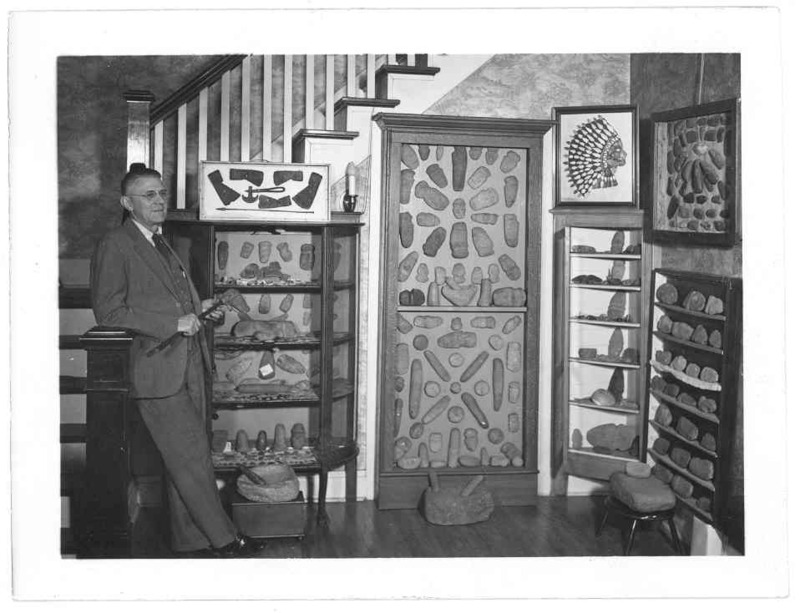 His work at Vera Cruz was especially instrumental in documenting the overlapping sequence of pits used by Native Americans to extract the jasper. At the quarry, once the blocks of high quality material were exposed, the low grade cortex was removed and other impurities were flaked away. Generally, the blocks were reduced to a transportable size. Some tools were finished at the quarry but most of this work was accomplished elsewhere. There are numerous workshop sites around the quarries documenting the final production of jasper stone tools. The work undertaken by the PHMC at the King’s quarry site (36Lh2) in 2002 added to our understanding of the prehistoric mining process. After conducting two controlled surface collections, recovering over 50,000 artifacts, a backhoe was used to cut a profile through the quarry pits. 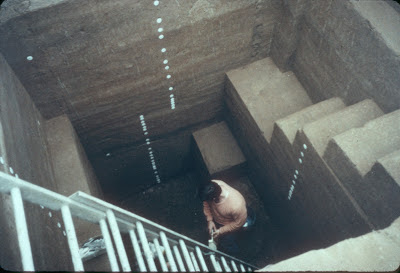 Here, an 85 foot wide, 23 foot deep pit was uncovered with several smaller pits located along the parameter. This confirmed Hatch’s work, although the King’s quarry pit was nearly three times the size of anything at Vera Cruz. Carbon 14 dates were obtained from the Kings quarry excavation and the investigators were able to date the various stages of infilling. Based on these dates, the maximum depth was probably reached during the Transitional period and the pit began to naturally backfill in stages up through the Late Woodland period. Hatch’s most significant contribution was the “sourcing” research he conducted with Adam King and Barry Sheetz of the Material Science Laboratory at Penn State. 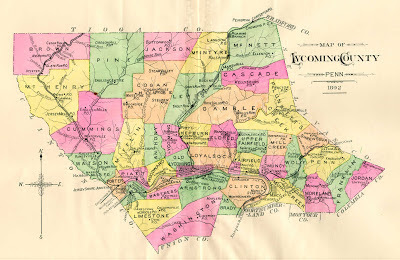 Jasper is found as artifacts from New England to North Carolina. Major quarries are located near State College in central Pennsylvania; in the northern Shenandoah Valley of Virginia; in northern Delaware as well as eastern Pennsylvania. There are some visual differences between the material from these quarries but they are all similar in appearance. In order to better understand trading patterns and to define territorial boundaries, it is important to know which quarry produced the artifacts from a particular site. Using geochemical analyses, such as neutron activation and X-ray Fluorescence spectroscopy to detect trace elements within the jasper, Hatch and colleagues were able to distinguish each of the main quarry areas from one another, but not the individual quarries within the entire Reading Prong. Contrary to popular opinion among archaeologists, his results showed that the Reading Prong jasper was not regularly moving outside the Middle Atlantic region to New England or the Southeast. The material from these four quarries rarely moved more than 200 miles. In addition, he found that many of the artifact samples he tested did not originate from the four main quarry areas, suggesting there were additional sources that have yet to be discovered. Finally, James Miller reported the quarry sites rarely produce any pottery. We checked our files and there is only one recorded pottery shard in the collection of the State Museum and based on the GIS files, there is only one site (36Lh19) in the county that has produced pottery (Late Woodland). There are many possible explanations but it is curious that Woodland habitation sites seem to be rare in an area so rich in lithic sources. In a letter to the editor of the Pennsylvania Archaeologist (1938), Roland B. Hill felt these quarries were so important that the state or federal government should restore and preserve the Vera Cruz quarry. That did not happen but Lehigh county purchased several acres and it is open to the public today. We hope you have enjoyed this glimpse into the archaeological heritage of Lehigh County. Hopefully it will inspire you to seek such publications as Indian Jasper Quarries in the Lehigh Hills by Mercer or any of the journal articles on archaeology conducted in Lehigh County and published in Pennsylvania Archaeologist. Understanding and exploring our archaeological heritage is pivotal to our understanding of human behavior and our ability to change and adapt over time- just as the peoples of Lehigh County have done for thousands of years. 1988 Stone Quarries and Human Occupations in the Hardyston Jasper Prehistoric District of Eastern Pennsylvania. Submitted U.S. Department of Transportation, Federal Highway Administration, and Pennsylvania Department of Transportation Engineering District 5-0. 1993 Research into the Prehistoric Quarries of Bucks, Lehigh and Berks Counties, Pennsylvania. Submitted to the Pennsylvania Historical and Museum Commission, Harrisburg. 1985 Procurement, Tool Production, and Sourcing Research at the Vera Cruz Jasper Quarry in Pennsylvania. Journal of Field Archaeology 12:219-230. 1954 Jasper Quarries of Macungie Pennsylvania Archaeologist 24(1) 20-21. 1938 A Visit to the Jasper Quarries. Pennsylvania Archaeologist 8(1): 65-66. 1997 The Chemical Composition of Jasper Artifacts from New England and the Middle Atlantic: Implications for the Prehistoric Exchange of “Pennsylvania Jasper”. Journal of Archaeological Science 24: 793-812. 1894 Indian Jasper Mines in the Lehigh Hills. American Anthropologist 24(1):20-21. This week our journey by county through the archaeology of Pennsylvania takes us to southeastern Pennsylvania and Lebanon County. 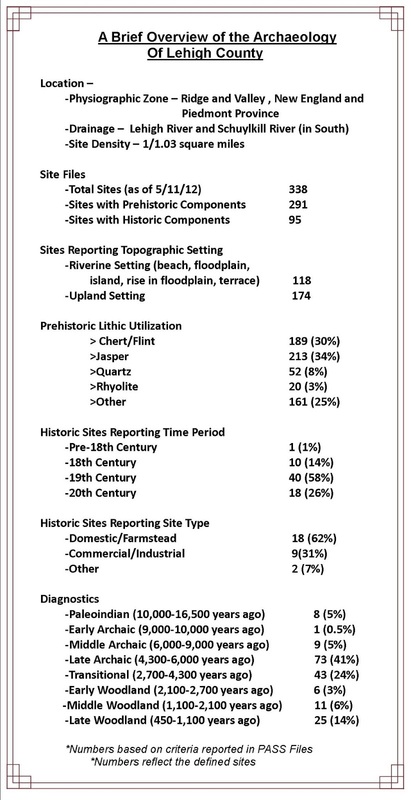 Although it does not boast extremely large numbers of sites such as Washington, Lancaster or Westmoreland counties, at one site per 0.68 square miles (based on the Pennsylvania Archaeological Site Survey (PASS) files), it is ranked third in the state for site density. It is mainly situated in the Piedmont physiographic province, but the northern edge includes the Great Valley and the Ridge and Valley zones. The Swatara Creek is the main drainage which eventually empties into the Susquehanna River. The Piedmont landscape is generally a rolling terrain with many small streams. This is reflected in site locations with only 39% of the sites in riverine settings. Lithic resource preferences are typical for the Piedmont zone, consisting of chert, metarhyolite, jasper, quartz and quartzite in descending order. Prehistoric sites recorded account for 83% of the sites, compared to historic sites at just 16%. The rural nature of the county is reflected in the fact that the majority of the historic sites recorded are characterized as domestic/farmsteads (88%). The prevalence of farming in Lebanon County has also contributed to the high rate of discovery and recordation of sites. The willingness and diligence of key individuals to record these sites with the PASS files is also an important factor. Although the county contains a high density of prehistoric sites, few have been systematically excavated. Nevertheless, the State Museum curates artifacts from this county representing well over 100 recorded archaeological sites through the efforts of avocational archaeologists. Jan and Warren Wise recorded a large number of sites from the eastern side of the county, but the majority were recorded and surface collected by Samuel S. Farver. This collection of sites and the associated artifacts is a representative sample of prehistoric materials from the region. 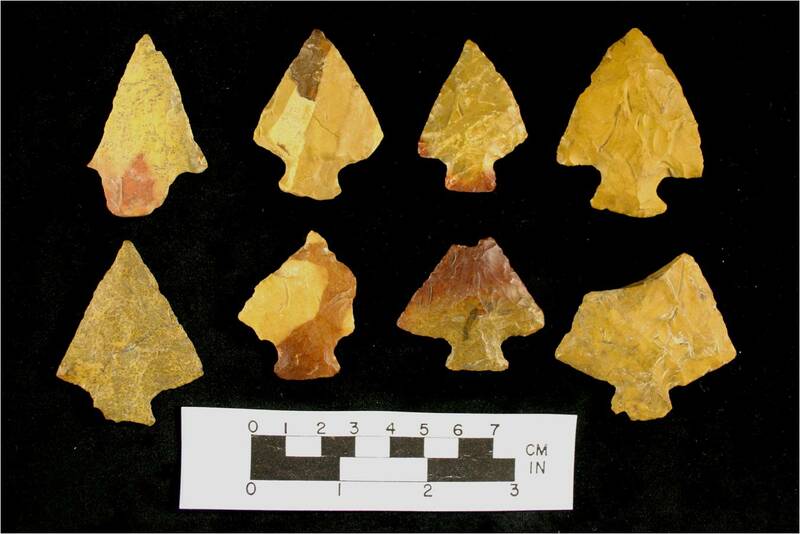 This collection has been utilized in research of projectile point typologies, but its research potential is limitless. One possible project could be to characterize sites from all time periods by lithic material and topographic setting in both the Great Valley and the Piedmont physiographic zones. We encourage any students who are interested in an internship or a senior thesis to contact us via The State Museum to discuss this or additional research projects further. One of these curated sites is the Wilheim site (36Le94). A multi-component site situated on the edge of the Great Valley on a slightly elevated colluvial terrace at the base of Blue Mountain. The collection is dominated by quartzite debitage and projectile points. Based on diagnostic projectile points, it dates to the Late Archaic (based on Bare Island, Poplar Island and Lackawaxen points), Transitional (Koens-Crispin and Snook Kill), and Early Woodland (Fox Creek) periods. However, the Wilheim site is best known for its Paleoindian occupation. In the 1940’s and 50’s Sam Farver was working with John Witthoft investigating the Shoop site in nearby Dauphin County. 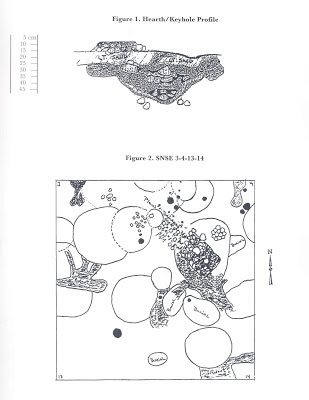 Primarily based on Farver’s intensive surface collection at the site, Witthoft (1952) published a detailed report. 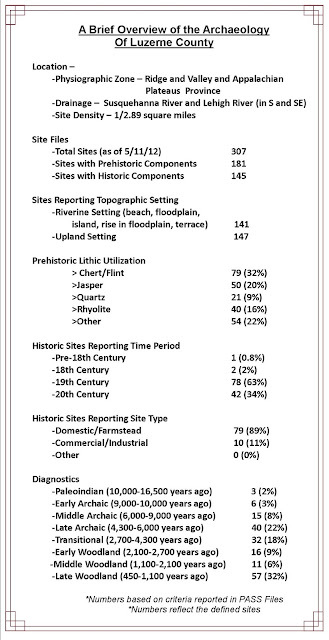 In this report, Witthoft also referenced the Wilheim site (recorded by Farver) and speculated that the two sites were related. The Shoop site produced over 6000 artifacts including 92 fluted points, over 500 endscrapers and hundreds of other Paleoindian flake tools. The lithic material is Onondaga chert, the source of which is located 250 miles to the northwest in western New York. The Wilheim site is much smaller, producing three fluted points, one endscraper and a small collection of flake tools, mostly in jasper from less than 100 miles away. Witthoft (1952) argued that Shoop was a major hunting camp occupied by a large band of Paleoindians. The Wilheim site was used as the large band dispersed into family groups and moved. Witthoft argued that Shoop was pre-Clovis in age and represented a group that was slowly migrating south from the Bering Land Bridge. In a very detailed analysis of the quartzite industry in the region, Jay Custer (1992) analyzed nine artifact collections from Lebanon and Lancaster counties. His most detailed analysis involved material from the Long site (36Le4 and recorded by Samuel Farver). These sites produced large numbers of early broadspears (Lehigh/Koens-Crispin types) along with narrow stemmed projectile points. He was able to show that many of these sites represented the early stages of tool production and were probably close to a quartzite quarry. Others were a greater distance from the quarry and represented late stage reduction and the final stages of tool production. However, both the broadspears and the narrow stemmed points went through the same lithic reduction sequence. In both cases the goal was to produce large flat flakes that served as blanks for projectile points and other tools. Custer also argued that these two point types were contemporary with one another and part of the same tool kit. 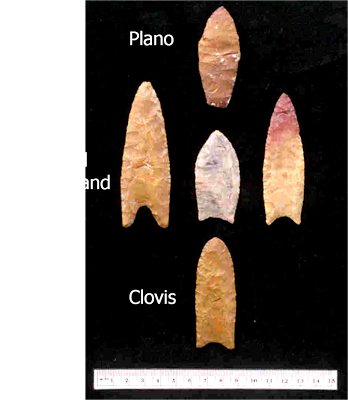 The narrow stemmed points functioned as projectile points and the broadspears functioned as projectile points but also as cutting and prying tools used in the butchering of animals. 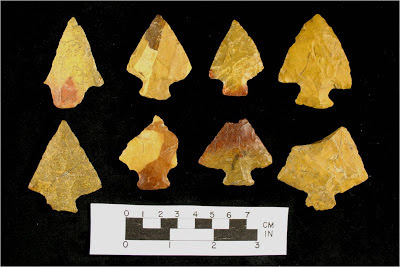 Finally, he examined lithic preferences and argued that beginning in the Late Archaic period, Native Americans preferred local lithics as long as the source material was large enough to produce broad flakes. Although quartzite is considered “tuff to work” it occurs in very large formations that allowed for the production of broadspears. Farver assisted John Witthoft, former State Archaeologist, (Witthoft and Farver 1952) in the excavation and analysis of two Shenks Ferry sites in Lebanon County; the Miller site (36Le2) and the Elmer Summy site. The Shenks Ferry culture dates to the Late Woodland period between AD 1250 and AD 1525 and is defined by a series of distinctive pottery types. These were an agricultural people, initially living in hamlets and eventually moving into stockaded villages. The Summy site is located along the Swatara Creek approximately four acres in size and underlain with a hardpan that made a controlled excavation impossible. Witthoft had the field deep plowed and located features while following behind the plow. Farver is credited with doing most of the field work and was able to identify twenty-five shallow pit features but no postmolds or burials. The Miller site was also difficult to excavate. It produced fifteen hearths, seven burials but no shallow pits features. In terms of domesticated plant foods, Witthoft noted that Summy only produced beans and Miller only produced corn as evidence of this early agricultural activity. However, the pottery from both sites was similar and Witthoft assigned it to the Shenks Ferry Cordmarked and Shenks Ferry Incised types. Witthoft concludes that the Shenks Ferry culture does not seem to be related to earlier cultures in the lower Susquehanna Valley but may be related to “Piedmont Siouan” groups. According to Witthoft, they were “destroyed and absorbed by the Susquehannocks shortly after the earliest Europeans penetrated into the coastal area”. The lithic resources and gentle landscape that appealed to prehistoric peoples also attracted colonial settlers to the county. In 1742 Peter Grubb established the Cornwall Iron Furnace http://www.cornwallironfurnace.org/ which continued to operate as a charcoal cold blast furnace until 1883. The furnace underwent extensive updates in the 1850’s and it is this 19th century furnace which visitors can view today. Located in a National Historic Landmark District this site is an excellent example of preservation efforts by the Pennsylvania Historical and Museum Commission (PHMC) which accepted the donation of the property in 1932. Through these preservation efforts this site serves as the best example of a 19th century iron furnace complex in America. We hope you have enjoyed this glimpse into the archaeological heritage of Lebanon County. Hopefully it will inspire you to seek such publications as Susquehanna’s Indians, Prehistoric Cultures of Eastern Pennsylvania, or any of the numerous journal articles on archaeology conducted in Lebanon County and published in Pennsylvania Archaeologist. Understanding and exploring our archaeological heritage is pivotal to our understanding of human behavior and our ability to change and adapt over time- just as the peoples of Lebanon County have done for thousands of years. 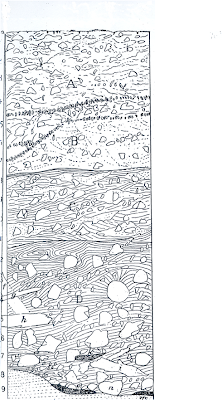 1992 Analysis of Late Archaic Quartzite Industries from the Long Site and Other Sites of the Middle Atlantic Piedmont. Pennsylvania Archaeologist 62(1): 12-47. 1952 A Paleo-Indian site in Eastern Pennsylvania: An Early Hunting Culture. Proceedings of the American Philosophical Society 96(4): 464-495. 1952 Two Shenks Ferry Sites in Lebanon County, Pennsylvania. Pennsylvania Archaeologist 22(1):3-32.